Coleman has written seventeen books and more than three hundred articles, has appeared frequently on radio and television programs, and has lectured throughout North America, as well as in London and at Loch Ness. He has been both on- and off-camera consultant to NBC-TV’s “Unsolved Mysteries,” A & E’s “Ancient Mysteries,” History Channel’s “In Search of History,” Discovery Channel’s “In the Unknown, ” and other reality-based programs. He contributes cryptozoology columns, “On the Trail,” to the London-based magazine Fortean Times, and “Mysterious World” to Fate, as well as regular articles to The Anomalist and Fortean Studies. In 2000, he served as the Senior Series Consultant to the new “In Search Of…” program which is scheduled for future broadcast on Fox and USA Network. During 2002, he was featured in the Sony Studios’ “Search for the Mothman,” available on the DVD of the movie The Mothman Prophecies. He served as the Screen Gems’ national and international publicity spokesperson for their Richard Gere-Mark Pellington movie. Coleman has been investigating, in the field and in the library, cryptozoological evidence and folklore since the Abominable Snowmen caught his interest over four decades ago, leading him to research mysterious Black Panther sightings and reports of Napes (North American Apes) in the American Midwest. He has traveled to every state in the USA, throughout Canada, Mexico, Scotland, and the Virgin Islands, interviewing witnesses of Lake Monsters, Bigfoot, Giant Snakes, Mystery Felids, Mothman, Thunderbirds, and other cryptids. His first article was published in 1969. He went on to write two books with Jerome Clark (The Unidentified  and Creatures of the Outer Edge , both published by Warner Books). In the 1980s, Coleman wrote Mysterious America (1983), Curious Encounters (1985), and Tom Slick and the Search for the Yeti (1989), all bestsellers for Faber and Faber. In 1999 Loren Coleman co-authored two books: one with Patrick Huyghe called The Field Guide to Bigfoot, Yeti, and Other Mystery Primates Worldwide (Avon); the other with Jerome Clark called Cryptozoology A to Z: The Encyclopedia of Loch Monsters, Sasquatch, Chupacabras, and Other Authentic Mysteries of Nature (Simon and Schuster/Fireside). 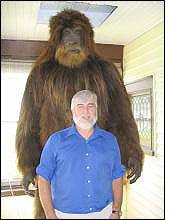 During 2002, Linden published the biography, Tom Slick: True Life Encounters in Cryptozoology. Coleman’s extremely popular Mysterious America: The Revised Edition (2001) and Mothman and Other Curious Encounters (2002) are published by Paraview Press. Loren Coleman’s special appreciation of his fellow cryptozoologists and hominologists has made him the source of biographical insights, and his obituaries and living commentaries on the leaders of the field have been published widely. National Public Radio’s “All Things Considered,” for example, called on Coleman to speak in tribute of Dr. Grover Krantz who died on Valentine’s Day, 2002. On 20 October 1997, on the occasion of the 30th anniversary of the famous filming of a Californian Sasquatch, Loren Coleman was one of the first ten inductees into the forthcoming Roger Patterson Memorial Bigfoot Museum in Portland, Oregon. He has been honored with other regional and national recognitions by his fellow researchers. Obtaining an undergraduate degree from Southern Illinois University-Carbondale, Coleman majored in anthropology, minored in zoology, and did some summer work in archaeology. He received a graduate degree in psychiatric social work from Simmons College in Boston. Coleman was admitted to the Ph.D. programs, and took doctoral coursework in social anthropology at Brandies University, and in sociology at the University of New Hampshire’s Family Research Laboratory. Coleman has been an instructor, assistant/associate professor, research associate, and documentary filmmaker, in various academic university settings, since 1980. He gave one of the first credit courses on the subject of cryptozoology in 1990, and examined cryptozoology films in his popular documentary course he taught through 2003 at the University of Southern Maine. He has written extensively in human services, having authored, coauthored, or edited eight books, including the critically acclaimed Suicide Clusters (Faber and Faber, 1987), appearing on “The Larry King Show” discussing it. His work on the suicides of baseball players was covered in Sports Illustrated, the Sporting News, ESPN, EPSN Classics and by all the major media and wire services. Loren Coleman can be reached at PO Box 360, Portland, Maine, 04112, USA, or by e-mail. For interviews with, profiles of, or stories about Loren Coleman, follow this link. Chosen for 2001 Popular Paperbacks for Young Adults List by the Young Adult Library Services Association (YALSA) and American Library Association (ALA), for Cryptozoology A to Z: The Encyclopedia of Loch Monsters, Sasquatch, Chupacabras, and Other Authentic Mysteries of Nature by Loren Coleman and Jerome Clark, NY: Simon and Schuster, 1999. The Anomalist Awards for the Best Books of 1999 for The Field Guide to Bigfoot, Yeti, and Other Mystery Primates Worldwide by Loren Coleman and Patrick Huyghe, NY: Avon Books/HarperCollins, 1999. The Anomalist Awards for the Best Books of 1999 for Cryptozoology A to Z: The Encyclopedia of Loch Monsters, Sasquatch, Chupacabras, and Other Authentic Mysteries of Nature by Loren Coleman and Jerome Clark, NY: Simon and Schuster, 1999. Bronze Apple – Third Place Award, National Educational Film & Video Festival, 1993, Category – “Teen Concerns,” for Mattering: A Journey With Rural Youth, Portland: University of Southern Maine, 1992; Loren Coleman, Executive Producer. Alumni Recognition Award, Simmons School of Social Work, 1992, for Elder Fire Safety for the ’90s by Loren Coleman and Kathryn Buxton, Portland: University of Southern Maine, 1991. Psychotherapy and Social Science Book Club Selection, August 1987, for Suicide Clusters by Loren Coleman, Boston: Faber and Faber, 1987 . Golden Reel – First Place Award, Independent Television Producers Association, 1987, for SOS – Runaways and Teen Suicides: Coded Cries for Help, Portland: University of Southern Maine, 1987; Loren Coleman, Executive Producer.